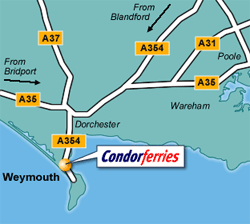 From our Weymouth Terminal you can travel to the breathtaking Channel Islands of Guernsey and Jersey or the beautiful french town of St. Malo.Condor Ferries Weymouth Terminal is easily accessible and offers a range of facilities. Our services operate between Weymouth and Guernsey, Jersey and St. Malo, Brittany. Take a look at the Weymouth Destination Guide and Weymouth Ferry Times. The beautiful town of Weymouth situated on the south coast of England and part of the English Channel is fantastic little holiday destination.Weymouth Sea Life Park provides the opportunity to come face to face with a variety of marine creatures. Attractions and facilities include separate otter, seal, turtle and penguin sanctuaries, a shark lagoon, a seahorse breeding and conservation centre, and a splash lagoon for children, complete with water slide, splash pool and water jets. Weymouth's seafront provides a long arc of golden sand with excellent and safe swimming. The beach is subject to beach management and includes a Beach Control Centre, first aid post, lost children centre and inshore lifeguard facility. There are several ramps onto the main beach for easy access. Deckchairs can be hired from several points along the beach. Family entertainment is also available in the form of trampolines, merry-go-round, pedalos and Punch and Judy. Portland is the ideal location for a summer family day out, where you can explore Portland’s environment and heritage, visit the Lighthouse Visitor Centre and take a guided tour around the Trinity House Lighthouse. Weymouth is fastly becoming one of the UK's most popular seaside destinations which is'nt surprising considering that it is one of the UK's sunniest locations and boasts long golden sandy beaches and safe shallow waters. It's an ideal place to enjoy a classic English beach holiday. Weymouth and Portland has a huge amount of history. The Weymouth Museum is located on the first floor of the Brewers Quay complex. The collection includes local paintings and prints from the 18th to 20th century, covering topics from Royal Weymouth to the development of Weymouth as a seaside resort. The Portland Museum is housed in two picturesque cottages nestling above Church Ope Cove. One cottage inspired the author Thomas Hardy to centre his famous novel ‘The Well Beloved’, making it the home of Avice, the novel’s heroine. The museum is the home of The Portland Gallery, and contains Roman Pottery artifacts and exhibits from Portland’s Victorian Convict Prison. Weymouth hosts a range of events throughout the year. In the summer months, the resort holds weekly fireworks, in addition to markets, sporting tournaments, such as beach volleyball, and the popular Weymouth Carnival. A popular annual event is the Weymouth Beach Kite Festival attracting 40,000 visitors to Weymouth Esplanade to watch impressive kite flyers not only from Britain, but the United States, Germany and Spain.